Are We Putting Too Much Emphasis on First-Person Shooter Stats? In today's 75 percent accurate edition of Speak Up on Kotaku, commenter BattleMoose87 wonders if we aren't giving first-person shooter statistics more weight than they deserve. Are we? Do statistics matter to you when playing online games? 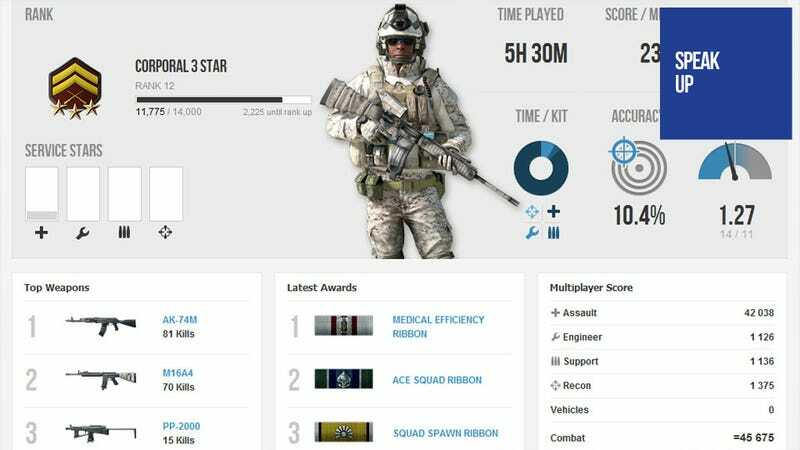 With the recent release of two shooter heavyweights in Battlefield 3 and Modern Warfare 3, alongside their own respective stat tracking services, I feel there is too large an emphasis on stats dictating how we are viewed next to our fellow gamers. For example, according to Battlelog I have an average accuracy of (gasp!) 5.7%. On its own that statistic is pretty shocking, but does it really reveal much about myself as a player? Am I someone who fires from the hip haphazardly, while my teammates thank the Lord (or admins) that team damage is off. Or am I someone who carefully suppresses the enemy so my team mates can advance and flank the enemy? Upon playing MW3 this morning I suddenly had stats yet again making an appearance. Apparently, teamwork is less important than getting lucky and finishing off an enemy. I can disregard stats when they are neatly tucked away somewhere, but when they are dragged kicking and screaming to the forefront of the multiplayer experience they make me sick. As the phrase goes: "There are three kinds of lies: lies, damned lies, and statistics."